The first month of 2018 has come and gone, which means UCF’s 34-27 Chick-Fil-A Peach Bowl victory over Auburn was over a month ago. Despite that full month passing, the Knights are still living in the minds of many throughout the country. UCF finished 13-0 and defeated the only team to beat the two College Football Playoff finalists. The Knights claimed the national championship, and why shouldn’t they? Former UCF coach Scott Frost spoke of what he felt was a “conscious effort” by the playoff committee to keep his team from being anywhere near the top four. His claim certainly has validity, as does the championship claim being led by director of athletics Danny White. However, none of this is sitting well with the college football “elite.” SEC fan bases, as well as sections of fans from other schools, including rival USF, aren’t taking UCF’s claim all too well. Plenty of members from the national media aren’t loving it either. But the dirty little secret? These people are keeping it all alive. New UCF coach Josh Heupel and his staff have been hitting the recruiting trail for weeks. Heupel’s players are already gearing up for spring ball. All the while, the Knights’ perfect season and national championship claim is still being talked about. Even Alabama fans and players, despite winning the College Football National Championship Game on Jan. 8, can’t help but talk about UCF. The latest came from Alabama running back Damien Harris, who felt strongly enough about the situation to take a jab when UCF was honored during the NFL Pro Bowl at Camping World Stadium in Orlando. Alabama fans latched onto the tweet, but UCF punter Mac Loudermilk came back with a tweet of his own. That’s just the latest example of the Knights getting free exposure, which is coming from all over the place. The UCF Football brand has reached new heights in the last 31 days, thanks in large part to detractors who continue to keep the Knights in the news. A year ago, who would’ve thought that UCF would finish as the only undefeated FBS team, get ranked No. 1 by the Colley Matrix and have a legitimate right to claim a national championship? But that’s where this program is after a wildly successful season and a campaign that it hopes will shift the paradigms of college football. The exposure for UCF’s brand started with White. The claim was made and he followed it by promising to pay championship bonuses, raise a banner in Spectrum Stadium and get rings for the team. All of that brought new levels of exposure. Then, the fact that this whole thing is calling attention to the flaws of the college football system also helps. It doesn’t end there, though. All of White’s work has riled up fan bases and media all over the country, which has only led to more brand building for UCF. And judging by the fact that it’s February and this is still going on, this won’t end any time soon. When the Knights take the field this fall, the narrative will continue. Broadcasters, writers, opposing fans and the college football world in general will keep the claim alive. All UCF has to do is bask in it, while at the same time getting to work on defending their championship. 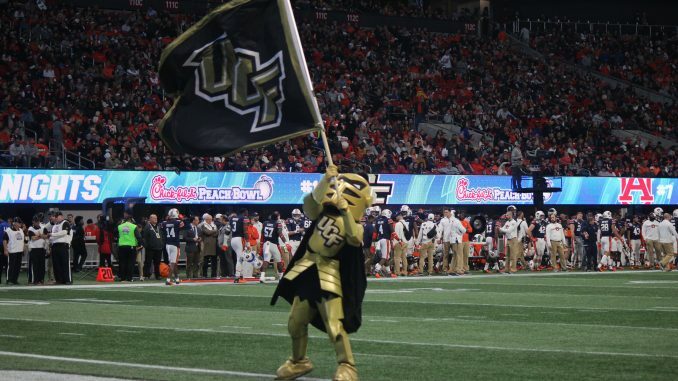 People can continue to scoff at the idea that UCF is claiming a national championship, but as long as the letters “U-C-F” are coming out of their mouths, the Knights will continue to laugh as they entrench themselves in college football history.